This is the first thing I made in my Machine Sewing Basics class that I took at Temple from September 21st until tonight. Not complicated at all, but it got me in the habit of using my sewing machine: a Singer Touch-Tronic 2001 Memory Machine. I actually got the machine in January but haven’t used it up until now. My teacher for this class was great: Gail Gaines. 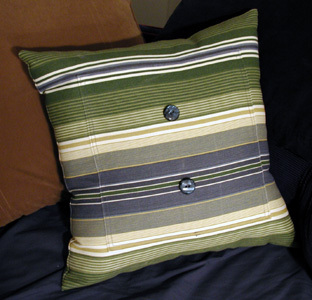 I like the fabric for this pillow a lot. It’s from a remnant I got at Stapler on 12th and Walnut. The buttons match pretty nicely, stripes and everything. I got them at Karlin’s on 8th and Filbert. I have enough fabric to make another one so I probably will eventually. this pillow is so hott right now!